Today, after decades of development, new inkjet printers can literally ink jets. Southwest Research Institute (SwRI), a R&D government contractor in San Antonio, fashioned a robot arm with sensors that negotiate aerodynamic curves of a jet fuselage, moving a print head that ink-renders a digital image onto the aircraft. 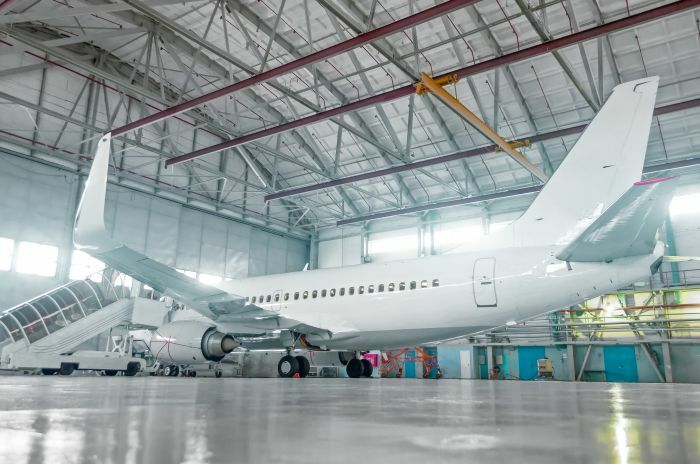 Aircraft coating has extensive requirements for accuracy. The weight of the paint and finishers affects the integrity of the aerodynamics and flight performance, and guard against corrosion from the elements. The 22-page FAA guideline on aircraft paint details all of this if you’re interested in learning more. The technology on your office inkjet printer dates back about 40 years. The rendering of digital images by computer-controlled machinery happens by drop-on demand, or DOD technology. It involves separating a droplet of ink from a main reservoir, adding heat or an electrical charge, and squeezing it through a tiny nozzle onto a medium. In the late 1970s, Canon and Hewlett-Packard developed Thermal DOD for paper printing in parallel. The film resistor films on inkjet cartridges belong to HP. Canon uses air pressure in to eject droplets, hence the name bubblejet printer. Epson invented printers that sent electrical charge into a crystalline material, heating ink drops and producing vibrations that force ink through print nozzles. That crystal-type technology, called piezoelectric DOD, gained popularity in the mid-1980s as a way to mass-produce fine art print work. Eastman Kodak’s IRIS printer was the first of its kind. The large format inkjets of today improve on IRIS by keep cartridges flushed to prevent dry, crusty nozzles—that’s what causes white streaks on ink prints—and have internal drivers especially for reading designs from desktop CAD software. When applied to objects that aren’t paper, inkjet technology is called direct printing—it prints directly on an object instead of a decal applied later. Sophisticated computer systems and robotics make possible inkjet printing on complex shapes. The new SwRI system is patented as “High Accuracy Inkjet Printing”—using AI to sense and navigate around the hull of the aircraft. A vision sensor detects an encoded pattern to accurately apply the graphic images. The encoded pattern is deposited on the surface in a known location with respect to the most recently deposited graphic swath. The printing system has high-bandwidth servo actuators to locate the print head with respect to the encoder pattern to enable precise positioning for the next swath. As aircraft shapes become more complex and hopefully printing makes air travel safer. Safety is well and good, elaborately detailed shark mouths sprayed onto military aircraft makes new inkjet printer technology worthwhile in and of itself.